One of Marrickville’s most iconic brunch spots has just opened up its second café in Surry Hills. Kelby’s Café mix Egyptian and Mediterranean influences with food science to offer patrons beautiful food with flare. There’s a whole lot more to get excited about here than your standard smashed avo. Conveniently located just footsteps from the soon-to-be-finished light rail, wandering customers will immediately notice the interior’s wooden detail, rustic décor, exposed brick walls and lush green fern feature wall complete with the warm glow of hanging bulbs. To complement its inviting features, the food will delight your taste buds. There’s a lot to try including Eggs Benedict, Warm French Toast, Eggocado (egg baked in a half avocado), Vegetarian Breakfast or the chef’s favourite, Kelby’s Hash, with baked potatoes, grilled halloumi, sujuk, baby spinach and caramelised leek complete with poached eggs and drizzled in housemade hollandaise. One we’d recommend is the Nutty Salmon with poached eggs, smoked salmon, beetroot hummus, walnuts and Danish fetta on sourdough with a side lemon wedge. Highly satisfying protein-filled deliciousness combined with the delightful crunch of walnuts – you can’t go wrong. For something unique, Kelby’s signature Egyptian Breakfast is a must-have. Essentially a Middle Eastern mash up of a big breakfast, this dish features oven roasted sweet potato with hummus, wild rocket, crumbled Danish fetta and poached eggs sprinkled with Kelby’s signature dukkah atop sourdough. The dukkah adds a lovely crunch and a flavour explosion. It’s a party in the mouth and something a little different than you’ll find at neighbouring cafés. For lunch, tuck into an array of nourish bowls, salads, burgers, toasties and wraps. Or opt for something heartier like a succulent steak sandwich loaded with salad leaves, juicy tomato, cheese, grilled onion and Dijon mustard with smokey bbq sauce on toasted Turkish bread. 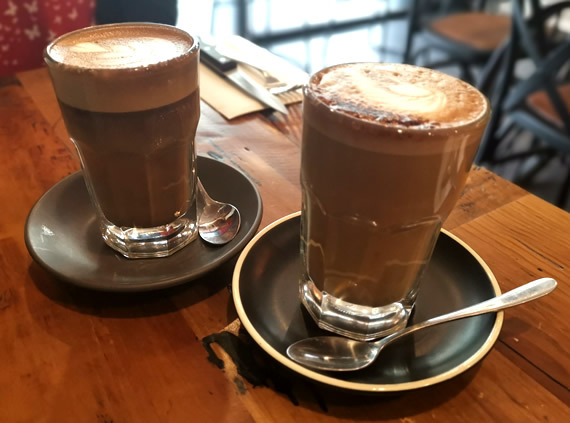 Offering an all-day breakfast with ingredients sourced from local producers, great coffee, and a welcoming atmosphere, Kelby’s Café is a fine addition to Surry Hills’ trendy brunch scene.